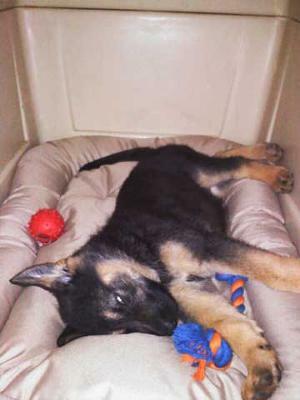 My German Shepherd Puppy, "Mieke"
This is my 8 week old "Mieke" sleeping in her crate. Comments for My German Shepherd Puppy, "Mieke"
Isn't she lovely, just as precious as she can be. Congratulation on your new baby. Be patience and loving, she will love unconditionally. She will be very protective, that's just a German Shepherd thing. Enjoy this time while she is little, next time this year she be big and can't hold her and take lots of pictures so you look back and she how she grow up. Take care of you new baby and she will protect you and take of you too!